The journey continues as the party travels through Mirkwood and finally reaches Lonely Mountain. As with LOTR, there is no saggy middle here. This instalment is a roller coaster ride, with the party encountering orcs, spiders, wood elves, men, and finally, Smaug. The best scenes include escaping the elves in barrels (also the funniest) and the encounter with Smaug, which is just stunning. We meet some new characters and are reunited with Legolas. Jackson weaves in many things that will eventually lead to LOTR sixty years later, including a whole subplot with Gandolf that reveals the real evil behind what is happening. And (warning/spoiler) the ending is a BIG cliffhanger! My wife literally cried out NO! when it ended. There were also several previews – Nolan’s Interstellar, Edge of Tomorrow, 300: Rise of an Empire, and Godzilla. While watching them, I realized that the Internet is a big negative sometimes. Online, we knew it was the teaser for Godzilla. But sitting in that theater, there was no clue until the end. People who hadn’t seen it online got the full impact, the big Wow, it’s Godzilla!! It’s a shame the Internet has ruined the surprise for us now. That said, seeing that teaser on the big screen was SO much better than online! They LOVED your interview. They said you seemed very genuine. Both of my classes said they "felt like they knew you" after reading your answers. We had a great discussion about your answer regarding themes and symbolism in books and whether authors deliberately create them. We also talked quite a bit about reading outside of your genre. I can't thank you enough for answering their questions!! They also loved the bookmarks! Thank you for those too! My writers really liked your advice to write what you want to read too. Hosted by Milo James Fowler at In Media Res! 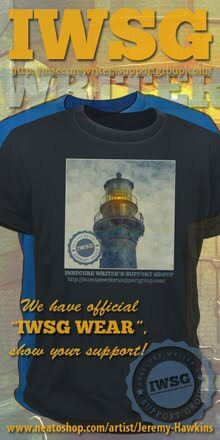 Check out his site for other participants. It’s every Friday in December, but I am being a rebel and participating today. I’m giving away a physical copy of CassaStorm, along with some swag. (If you live outside the USA, you win all three of my books in eBook.) Comment to win. The Fussy Librarian featured CassaStorm on Sunday in their recommendation email. If you haven’t signed up for their service yet, visit their website. LG Keltner is celebrating two years of blogging by hosting the Endings Blogfest on January 9 – see her site for details. Susan Oloier’s Haunted comes out December 17 – congratulations, Susan! Michael Abayomi’s The Morning Star, a prelude to Guardians and The Lost Paradise, is available at Amazon now. Congratulations, Michael! The second book in Jack Lewis Baillot’s series is out – Abolished Impracticality. Congratulations, Jack! Ali Cross revealed the cover for her upcoming book, Blood Crown. Can’t wait to read it, Ali! The first ever "Online Marketing Symposium" Monday, January 20, 2014. A blogfest with information you can use! Hosted by Arlee Bird, Yolanda Renee, Jeremy Hawkins, and Alex J. Cavanaugh. Do you ever wonder why some books become bestsellers while others can barely be given away? Why some businesses succeed and others fail? How does a blog post or a YouTube video manage to go viral? Is it a matter of luck or is there some magic formula for success? Well, now maybe we can latch on to some of the secrets and tricks that make success happen or what we might want to avoid. We want you to tell us your stories of success (or not so successful) as we present a blogging event that will help us learn. On event day you tell us about a marketing idea that you've used and what worked or didn't work. Your post could describe a campaign that succeeded in a big or small way or one that failed drastically. Tell us about a business campaign, an organizational event, a fundraiser – anything where a bit of promotion was necessary! 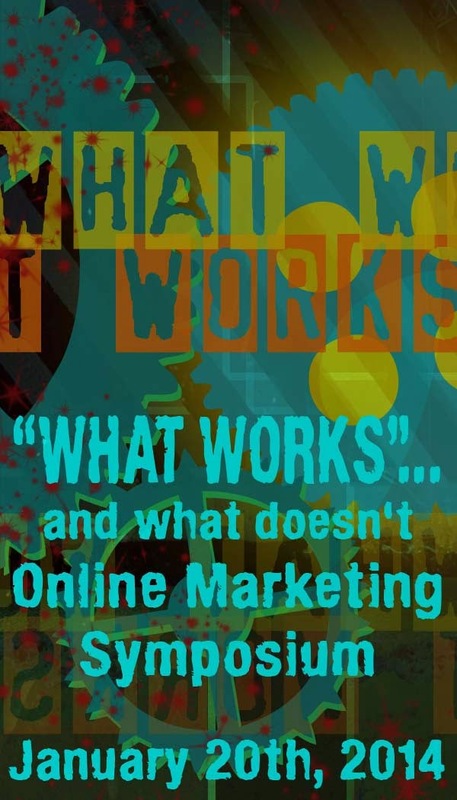 The What Works.. Marketing Symposium is not limited to authors but also to anyone in a business that has a promotional aspect – online or otherwise! It's possible the blogging community can help you make that next project a viral success or that next book a best seller! Join our first ever Online Marketing Symposium – sign up below! Want one of those guitars? Did you see The Hobbit? Want to win a book? And what marketing tip can you offer…? Love the guitars! They look great! Just signed up for the discussion about "What Works and What Doesn't." Good idea to help out others. Am I the first to comment? Wow, if I am that will be a first! Wow, I was the first! Can't believe it! I've tried everything, and none of it has worked yet, Lol! Oh well, I'll hop around and see what worked for everyone else. Hobbit! Sounds incredible and I am yet to see it. Very excited !! Great post, Alex! Those guitars look absolutely amazing... if only I was awesome enough to know how to play. I'm a little keen to see the new Hobbit movie, among a few other movies that are out and I haven't gotten around to just yet. Thanks for reviewing it, I'm looking forward to it! Great guitars even if I'm all thumbs. Being disabled will have to wait to see 'The Hobbit' on Blue-ray. So until January 20th - signed up - I will be hoping release of my crime novel works out, so I have a positive experience to relate... unlike my failed films. The Hobbit sounds like fun, thanks for the review. And love the fancy guitars - wish I'd kept up with my lessons. It will be a fun blog hop - looking forward to it! Congrats on the positive influence and response with the kids! That really rocks! Those are some cool guitars! That spider scene in the Hobbit movie sounds scary. Not sure my family will be wild about the cliffhanger, though. Nice of you to interview with the middle schoolers! Hi Alex .. aren't the guitars great - fun! Smaug - it's on here and I hope to get there .. your review sounds as though it's a good one. The Marketing Symposium in January .. also good ..
Those guitars are so cool! Oh man. I have to see the Hobbit. I've been so excited about that movie! Fifty States of Pray. WOWOW. We need that, pal. CONGRADS SUSAN!!!!!!!!!!!!!!!!!! I love her!!! Love the guitars! Sorry about what's going on with my blog posts this morning - I didn't delete your comment. I had to keep reposting my post because it kept saying it wasn't successful?? I have not seen the Hobbit, but those guitars are awesome. Godzilla is a must see for me, for sure. I am a big fan of the monster. Those guitars are amazing. I don't play and I still want one. Can't wait to check out the seminar for tips. I'm very excited to see the new Hobbit film, it's going to be a post-Christmas day treat for my husband and I. What a great way to get over the madness of the children. LOVE the Millenium Falcon guitar!! Carolyn, you were the first! Thanks for signing up. Shah, bet you'll find something that works. And counted! Roland, hope the book is a big success. Yolanda, the interview with them was fun. Robyn, yes we do need it! Keith, that's all right. Funny, it showed up four times I think. Interesting blogfest indeed. Have to think about that one. The first guitar is the best, seems way more well designed. Awesome with the class book interview and fyi blogger has a hate on for you today, or just me, never showed up in my blogroll. Oh, those so awesome looking guitars! Those are some neat guitars. I loved the second Hobbit movie. I'd love a great SF guitar. I'd probably play again if I had one. Watch out Yngvie - I'm back. Well, I'm not. But I might be if I had one of those. Missed the Hobbit. Will try to see it later this week. I'm such a disappointment to myself. 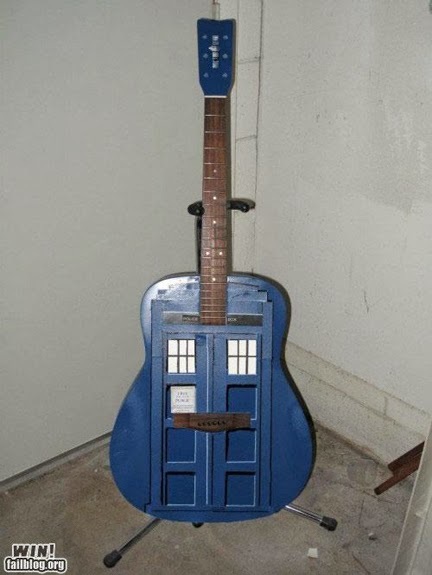 Tardis guitar?? Awesome! I finally got around to watching the first Hobbit, so hopefully I'll head out to the theater to see the second. Thanks for all the info. The Marketing Tour sounds like a great idea. I'll give some thought to participating, although I'm rather new at the whole marketing thing. Looking forward to seeing what everyone has to say. Love those guitars, I would like the Star Trek one please. Would love to see The Hobbit, will have to wait for it sadly. I already have all three of your books on my Kindle, thanks. Actually I just won books from Yolanda Renee and was thrilled. I could not believe that's where they ended the movie either! I sat there, waiting, just in case they were messing with us. But no. I thought it was a great movie! Very cool looking guitars! I would love to see the Hobbit, but it will have to wait until it comes to the Redbox. The blog hop sounds great! I don't think I have any helpful tips, this is not my strong suit, but I look forward to reading other peoples' posts! At first I was like psssh, sci-fi guitars, I bet they look lame. Then I saw the Tardis one. Okay, I kinda want it. A lot. Also, I'm really looking forward to seeing the new Hobbit movie. However, I'm not looking forward to the ending. My wife, having never read the Hobbit, will probably be complaining about that cliffhanger the whoooole ride home asking "What happens? What happens?" Those guitars are so cool. Haven't seen the movie. I want to read the books first - someday. Merry Christmas, Alex - enjoy this holiday season. Pat, I didn't show up? Bummer. Rusty, you NEED a guitar! Karen, I bet you'd have something great to contribute. Jo, thanks. And I would want a Star Trek one! Kimberly, it was the ultimate cliffhanger. Rachel, I bet you do. Brandon and Bryan, don't tell her! The alien guitar is my favorite. Glad to hear the movie was good, I'm anxious to see Luke Evans - he's one of my favs. Awesome guitars! You know, I promised myself I'd cut down on the blogfests next year, but this is one I don't want to miss. What an excellent idea! I've signed up. It's my blogfest for January. My movie for the weekend was Man of Steel. I liked the guy that played Superman, but I didn't like Lois at all. And Zod, meh. I want Lex! We're excited to see The Hobbit 2. Maybe after Christmas. Today goats totally rock. Hmmm...I wonder what my youngest son would choose. That blogfest sounds excellent! It falls on a day I will be traveling so I will have to catch up on it later. Those guitars are so cool! And the symposium sounds fantastic, what a great idea. I know I need all the marketing help I can get. Those guitars are awesome! Merry Christmas, Alex and I'm glad your interview was such a success with the kids! Capn Ninja!! I am GREEN - about to explode and spew GREEN - with envy!! You saw the Hobbit before me!!!!!!!!!!!!!! Aaaaaaaaaaaargh! LOL! Off I go to find a bucket. Ahem. I like the guitars, especially the first one. Not sure what to make of the third one though. Love the cover on Haunted & Blood Crown. All signed up for the Symposium. Ah, talking to kids in schools is so much fun!!!! I did a lot of it but not in the last year. I should get back to it. And those guitars are very cool! Christine, you've been so successful - glad you're on board. Kitty, go see it soon! Catherine, I really enjoyed it. Cool guitars! I've also seen some amazing Star Trek guitars around -- shaped like the communicator badge, shaped like the Enterprise, and shaped like a phaser. Haven't seen The Hobbit yet, but this week or next. Glad your review was great -- I've actually seen some that are less-than-favorable. But I love The Hobbit and LOTR so I know I'll love this one, too. I haven't signed up for the symposium. I don't have anything to market (yet). Plus, I'm not sure about the presenters -- do you think it just might be some sort of a scam by a bunch of online hucksters only interested in taking my money??? Love the guitars! I can imagine you having them. Very cool about talking to those students. I love the alien/predator guitar myself. Those guitars were awesome. I know a few guitar-playing sci-fi fans that would go crazy for those. And I was kind of ho-hum on the Hobbit movie, but I loved the scenes with Smaug. The hobbit movies are very impressive but still feel 3 of them is a bit much. Holy ALIEN guitar! That rocks. In more than one way. Thanks for sharing all the good news about these new releases. I saw your book in the F.L. email! So cool! Cheers, Alex! Another great year. Explode is right, there's a whole lot if information here. Wow, I love those guitars, especially the Aliens one. The Star Wars one is pretty sweet, too. I'm not into The Hobbit though I did see the time-travel rom-com About Time at the dollar theater this weekend. It was pretty good. My marketing strategies are not too sound so I have a lot to learn from that blog hop! I can never get enough of The Hobbit or LOTRs. That first alien guitar is very interesting. I'd like to see what the back looks like. I'll lurk on the edges re promotion; good luck with that blogfest in January (usually a slow month). I'm sure it will help many of us. Merry Christmas and Happy New Year Alex, to you and your family. Chris, funny! You should sign up. I'm sure you've seen stuff around here that doesn't work, from a reader's viewpoint. Knew you'd dig the guitars. Need to track down those Star Trek ones! Heather, glad you saw my book! Jennifer, you can share what didn't work. DG, the cast could just sit around and I'd still watch it. 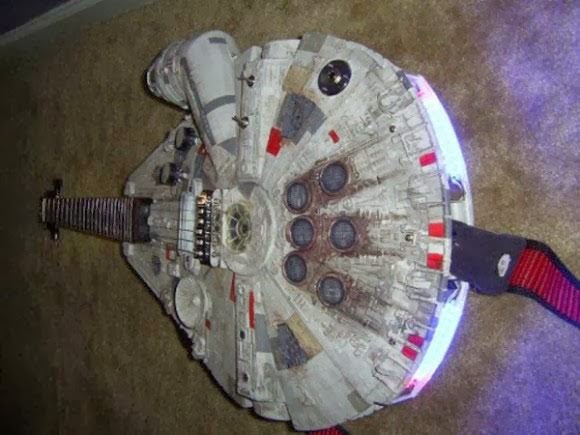 that millenium falcon guitar rocks! Wow, that Falcon guitar is just amazing! Wow! Love the Alien guitar! Turning the Millennium Falcon into a guitar was truly inspired, but the "Alien" one is still my favorite. Hoping to see The Hobbit soon. Hobbits... argh! I have heard so many good things, but I promised I would miss them in the show and wait for the DVD/BLU-Rays. I am sticking to my guns, we want to see the boxing movie with Dinero and Stallone... yes I know. Need a mental ride, for a few days. 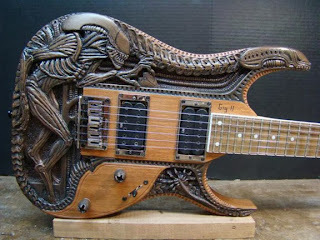 Oh my... must have that Alien guitar just the coolness. The others are neato, but that first one. Whatever works, will work... there are so many great directions and people with great ideas. Have a great day to you and everyone. With regard to those guitars... I am constantly amazed at how creative people can be. They are works of art in addition to making music! Also looking forward to the 50 States of Pray! Glad the interview went so well Alex. Might try to see the hobbit sequel at the movies this time. Those guitar look ready to rock and maybe even do some time travel. Happy Holidays. Brian, sorry he's been sick. Nice of you to wait. Jeremy, no way I could wait! That's a great idea for a symposium. I'd gladly take any of those very cool guitars. Ooh. I'll be reading those tips during the marketing symposium for sure. Such a great idea. Those guitars rock! Ba-dum-chh. And I thought the barrel scene was awesome, too. I think our whole theater yelled out NO! at the end, haha. I HAVE to show my older son the guitars when he gets home from school. He's a natural musician with a bend toward eccentric guitars. I want to join the blog fest, but don't think I have anything to add. I'll think on it today. BTW...thanks so much for the shout-out! I'm not at all musical, but I still want one of those guitars. The Millennium Falcon as a guitar? What a piece of junk! I can't wait to go see the next part of the Hobbit. I want to take my girls. That's some high end art on some of those guitars. The Hubby would love the first one and if I wasn't broke, it would make a nice Christmas present for him. Excepting I'd have to buy him a new guitar elsewise he's miss one of hiss and the jigg would be up. Great looking guitars! The symposium promises to be a wonderful learning experience. Those are some awesome guitars! Particularly the HR Giger one up top! It's occurred to me that I should maybe keep my opinion of Hobbit: DoS to myself, because my opinion is an unpopular one. The Hobbit is my favorite book of all time. And so my question is, if Peter Jackson is such a big fan of the source material, WHY'D HE REWRITE IT? I'd like to see your interview! Have you considered posting it here? The Fussy Librarian actually recommended your book to me! Congratulations on that! Also, I hadn't seen anything from Michael's blog in a while. I'm heading there next! I better go ahead and start preparing for that one. Looking forward to Fifty States of Pray. Great that you did the special interview for Kimberly's class. That's something the children will not forget. Great looking gee-tars. I haven't seen The Hobbit, but with your review, I may just. Re: Marketing. There's a book that's considered the bible when it comes to marketing, it's called, Positioning, by Reece and Trout. I don't care what the product or book is, anyone can benefit from reading that. Yes, these guitars are pure fantasy! Genial! I love those guitars. I can't decide which one I love the most! When I watched "Metallica: Through the Never" I noticed Kirk Hammett had Bela Lugosi from the film White Zombie on one guitar and Boris Karloff as Frankenstein's monster on the other. Yet another reason to love that guy! Love the guitars, especially the Tardis. Can't wait to see Smaug but I'm waiting for my daughter to get home from college. Sounds like an interesting symposium. My heroine from Lyon's Legacy would like a guitar with a double helix pattern, please. The marketing symposium is a great idea! I may have to double-post that day and participate. Whoa! Those guitars are pretty cool. Congratulations to LG, Susan, Michael, Jack, and Ali! Those guitars are crazy sick. REDRUM. This one made me chuckle a bit. Haven't seen The Hobbit 2. Yet. I've heard nothing but great things about it. I've been known to yell out at the end of a book or movie. I hate and love cliffhangers. Books work me up more than movies though, because I can throw them across the room or hug them while I weep. Ooooh...a Millennium Falcon guitar? Too cool. Thanks for joining the #Tismoreblessed throng, Alex! Neat guitars, especially the Falcon. And I loved Desolation of Smaug! 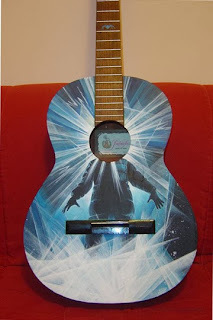 I'm loving the Doctor Who guitar! And I'm pretty behind on my movie watching. Still haven't even seen The Hobbit yet, which I plan on doing over my week long vacation next week. My son's English teacher wants me to come into the classroom for an interview. I might need some tips from you. Ilima, the one for Edge of Tomorrow is haunting. Susan, he will dig them! And you are welcome. Leigh, thanks for the suggestion. Sean, those were cool guitars, weren't they? Milo, thanks for hosting it! Awesome that you found those guitars. Wouldn't be surprised if you found a way to put them into a story. Glad you loved The Hobbit movie. I can't wait to see it though I'll probably have to wait to rent it. And sounds like an awesome blog hop. I'm looking forward to learning from it since I've never tried to market anything. But how do the guitars sound? That's the real question. We went to see Frozen. No one in my family wants to see DoS after the fiasco of the 1st movie. I'll get around to at some point, but, as I told my creative writing students, I'm not quite up to ambivalent about it, yet. You have helped so many people with your words. Oh man, I cannot wait to see The Hobbit, it sounds awesome! I re-watched the first one the other day, but I'm not sure when I'll get to see the next one. Hopefully I won't have to wait too long! That Doctor Who guitar got me. Too awesome. I'm totally stoked for the symposium. What an amazing hop! I'm all in. Not only a TARDIS, but the Millennium Falcon that lights up! You outdid yourself on the geek scale. Thanks for the Hobbit review. I have had a busy time, and probably won't get to see it till after the holidays. I haven't managed to see The Hobbit yet but looking forward to it! Those guitars look awesome! Those guitars absolutely rock and I very nearly ruined my keyboard with drool. So much great news all around. Man, I have missed being here. I promise not to stay away so long again. I loved the guitars, especially the Alien one although The Thing is close behind ... and the Millennium Falcon. Aw heck, they were all awesome! Congrats to LG, Susan, Michael, Ali, and Jack! I saw The Hobbit last weekend and I was disappointed. It could've been better. The marketing blogfest sounds cool. I think I may participate in it. I wonder if I could tell how I promote my blog, but I don't know if that would work. Jay, best tip I can offer is just be honest with them. They really appreciate that. Natalie, I'll work on a rock star story for you. Andrew, the one I'd be concerned about is the Falcon. Looks like it would be difficult to play as well. Crystal, glad you're on board! David, at least I'm good at something! Melissa, I would never forget you!! Lexa, you should've seen their questions! I really had to use my brain. Livia, sounds like that would work to me. The guitars are awesome! I'll have to save those pic's to show to my son. (He plays) My personal fave is the starship. I'm so glad to hear you liked the Hobbit Movie. I've been hearing bad reviews and we plan on seeing it next week. Congrats to all the book releases. Cool guitars! I had to skim thru your Hobbit review so I didn't get any spoilers. I cant wait. Love the comments from the class. That's the coolest! Ahhhh, GOTTA go see Hobbit!! Benedict Cumberbatch (Smaug) is one of my all-time favorite actors ever in the history of ever. Definitely drooling over those guitars! Crazy talent there! 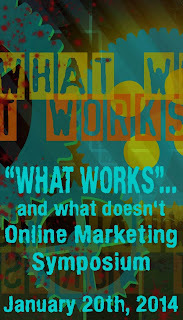 I love the Online Marketing Symposium idea. Brilliant. As for the Hobbit, my daughter saw it the day it opened here and love it too. Me, I will wait for the video. The last guitar was my favorite. Sounds like a great blogfest, but with an ailing PC I'll have to refrain. The netbook here just limps me along and I'd be online all day. The Millennium Falcon guitar wins in my books, but the Predator and Dr Who come a close second. 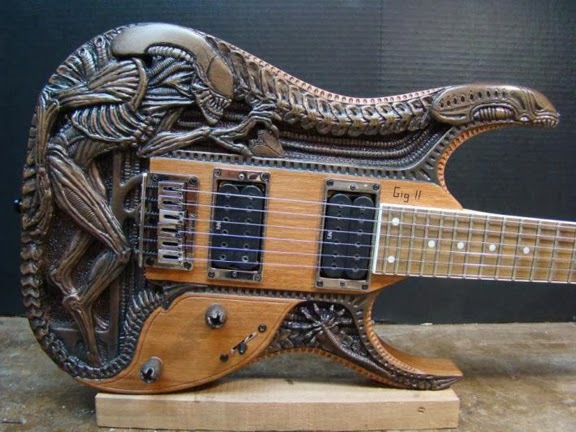 The Alien guitar is pretty badass. I'd get one. The only way to avoid spoilers is to not go online ever. I, however, look up endings on Wikipedia all. the. time. Love Doctor Who, not so much the guitar though. Neat idea though, but just doesn't fully work as well as a Doctor Who cake. Some of those are pretty darn neat. Those guitars look as if they could play themselves. They are amazing. Great to be a part of the What Works Symposium. Just signed up. Here's to tons of success on the Mark Koopman's Fifty States of Pray. Cathrina, ignore the bad reviews and go enjoy! Rhonda, I really like that one as well. Lynda, he was in the movie, that's for sure. Okay, I NEED that Falcon guitar! All signed up for the symposium! Not sure if I can add more than some of the names already signed up, but I'm looking forward to learning from everyone. The marketing thing sounds great. I can't wait to see The Hobbit. Have a great Christmas. Sweet guitars!!! I don't play, but if I did, I would go for the Millennium Falcon. I'm looking forward to the 50 States of Pray, and I'm going to have to figure out how to read all the awesome books that are coming out. BTW, I signed up for the marketing hop, although I don't know that I have any advice to give. Oh, and I wish, wish, wish I could go see The Hobbit right now, but . . . my family coerced me into waiting until New Year's Eve - two whole weeks away. :( Somehow I'll make it until then . . . maybe. oh, and I don't need a copy of CassaStorm, because we have one wrapped under the tree (something else I've been waiting for . . . again, thanks to my family's plans). I think they are trying to teach me patience. Thanks for advertising my blogfest! You rock! Also, I would love to own any of those guitars. I can't play guitar, but I've always wanted to learn. I hope we can do this again next year too Alex! It was such a wonderful experience for them! BTW - we had a few extra bookmarks we sent to our sister school - an underprivileged school in Chicago. For the holidays, we put together gifts for them and donated books. We inserted CassaStar bookmarks in some of the books. The kids were very excited about it! I would love one of those guitars. I'm great at air guitar. No strings attached. Not seen The Hobbit. Of course, where I live, I might as well be in the movie. That is well neat you got interviewed by Kimberly's middle school classes. What a nice email. Links duly noted. I'm sure you will have a fulfilling time with Mark's Fifty States of Pray. I think many people get intimidated by the concept of marketing or think it doesn't apply to them. We all use it and are exposed to it to some extent every day. I'll be doing a couple of posts that will hopefully encourage more people to tell us about "What Works..."
EJ, I bet you can add a lot. Tonja, you as well! Good to hear from you. Tyrean, I bet you have a lot to offer. And a copy of my book awaits you under the tree? That is awesome - thank you! Kimberly, thank you!! I appreciate that. Sorry I wasn't able to post this until today. Gary - bad pun! But funny. Lee, after Christmas we will see more. Sharon, I bet you could. I'll definitely be tuning in for the marketing symposium, but mostly just to read and learn (and comment of course!) since my marketing experience is really limited. I'm looking forward to it though! My mum yelled no too when she saw The Hobbit ending cliff hanger. I was glad they did it. I'm not ready to see bad things happen to certain characters. Star Wars and TARDIS guitars! Those are so cool!! The Aliens guitar looks like a deadly piece of artwork. Giveaways always work. I don't know if I ever told you, but I used to play guitar. Started when I was in middle school, got my first real guitar of my own and not a school rental for my 16th birthday. Now I have a fused wrist and literally can't play anymore. However, The Transporter has taken over the family legacy and plays a mean electric. Completely forgot my point about the whole guitar thing...I really, really want a Tardis guitar. Even if I can't play it. 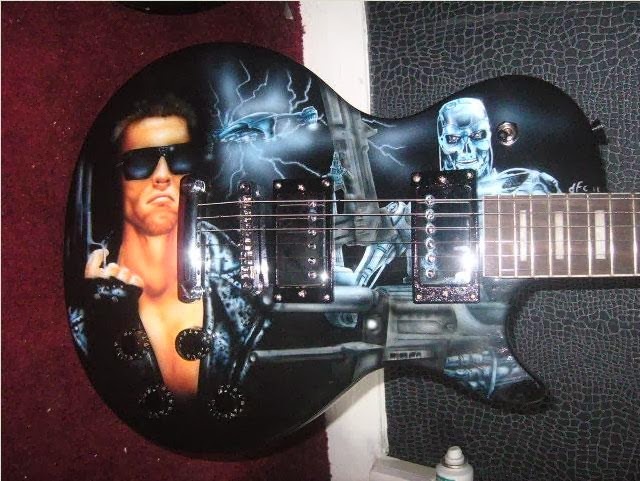 Coolest guitar EVER. How really rewarding it must feel to be interviewed by middle school kids! They're so enthusiastic and genuine at that age. You've got a new generation of fans! Oh, and I'd also love to win a copy of CassaStorm. That sounds like such fun to be interviewed by the kids, and even better that they were left with that feeling of knowing you. Really cool. Very sweet about the class! Kids are so smart and so earnest. And Oh Em Gee...the Alien guitar is spectacular! So awesome! Great about the class interview. Hopefully many reluctant readers were turned onto books. Marketing is quite a problem, but answers will be found. We watched THE HOBBIT a few days ago and I had a similar reaction to your wife at the end. That was definitely one major cliffhanger! I thought Smaug was REALLY well done. He was scarier than I expected. Kristen, hope it helps you! Jack, I think a lot of people yelled! I like the science fiction guitars. And your advice to writers to write what they want to read is spot on. This will help us write books that readers will love to read. That Alien guitar is awesome!! I'm looking forward to seeing LOTR when my son comes home from college. I always enjoy the dwarfs. Oh my goodness, I don't even play guitar and I want them all! Gimme! Hope you have a Merry Christmas and a Happy New Year! Rachna, that's how I've always written. Elsie, then you will really enjoy the barrel scene! JA, Merry Christmas to you! I love those guitars... funky! I love the guitars! There was one hanging in our church for awhile that someone had painted a mountain scene on. I loved the idea of it being a canvas. I CAN'T WAIT to see the desolation of smaug- I have no doubt it will be just as amazing as the first (which was pretty effing amazing!). Congrats on wowing Kimberly's class, I'm not surprised they loved you so much. Thanks for letting me know about L.G's celebration- I'll go sign up now! Speaking of which, do you know about John's Best Reads bloghop? He does it every year and it's always lots of fun. Looking forward to The Hobbit. I'm a longtime Tolkien fan. Glad you enjoyed Hobbit 2 so much! I don't know if I'll see it until it hits Netflix. But I am very keen on Interstellar and Godzilla. Hope those movies pan out well. Wonderful, I'm sure you enjoyed the questions of the students! The first guitar is just awesome! I want it and I don't even know how to play! Michelle, I bet you could offer something. John, they come from fine directors, so they should be good. Those guitars are amazing! Do you have one? The marketing symposium sounds interesting, I look forward to it! That movie sounds awesome and I love those guitars. Those guitars are really groovy. I never learnt to play an instrument, but I always wanted to learn violin. For the last 10 years or so, I've been more interested in the vielle and dulcian. The marketing blogfest should be interesting. I'd love some tips for one day starting my own small publishing house and an embroidery business. Carrie-Anne, I'm sure you'll get a lot of good tips. Sakib, copy the badge (save image as) and then add it to your blog as an image. I can email you the image if it will help. Have a wonderful Christmas!! Love the guitars. Oh Alex! The guitars! My husband would fall over if he saw these. I haven't seen the trailer for Godzilla yet, but I'm glad it's getting good responses. Roland Emmerich ruined Godzilla for me. 'Pacific Rim' gave me hope. Embarrassingly, I don't actually have much to share about marketing in either direction (good or bad) - that's how little experience I have with it!!! I'll definitely READ everyone else's to learn, though. And if I can come up with anything...at all... I'll join in! My son is the guitarist. He's a natural and self taught. It amazes me. And speaking of my son, he went out and saw the Hobbit as soon as it was released. Sounds like a great interview. I could learn a lot from your blog hop, but my marketing skills are nill. Merry Christmas and good luck to one and all! Awesome guitars... I won't be showing my Hubby, he'll want all of them, and we don't have room! MsMariah, let that hope build. And be sure your husband sees these. Liz, you'll get to learn! Doralynn, your son has a gift. Annalisa, you'd have a lot to offer! And no room? How many guitars do you already own? Can I get a science fiction guitar that plays itself? Because I've always wanted to be a rock star. Awesome guitars. I don't know now about The Hobbit. The movie sounds fascinating but I HATE cliffhanger endings. Have a very merry Christmas, Alex. See you next year. Cheers for The Hobbit ! Hi Alex, WHOA! Those are some pretty snazzy guitars! I am in awe of all the irons you have in the fire…and juggling them all so impressively! Jennifer, a couple of those just might play themselves. And just go to the movies anyway! Emilyann, I think he's done fine with the series. Ella, the interview with the kids was fun! Donna, as long as I don't drop any of those irons. If I comment several times, so I get extra chances at winning? My husband was shocked by the cliffhanger too. Only he didn't take it as well as your wife. I had to give him a punch in theater and remind him of his language when he yelled out an, "You've got to be *bleeping* kidding me?!" Signed up for the blog hop. I actually have some things I am ready to say! Those physical copies...I'm assuming they would be signed right? That's what gives me my book envy and makes me willing to try to rig the contest. Ah, those guitars...yes, I am drooling. There are several people in my life who'd love one. What a fantastic idea for a blog hop! Signed up. I hadn't seen the Godzilla trailer! I was totally shocked in the theatre, it wasn't what I expected at all! Love the marketing blogfest idea! Maybe you could talk a bit about your talks in front of the kids - I'm too shy for that sort of thing, but love it when authors take the time to do it. I'll be going to The Hobbit tomorrow. By the way, the ultimate Christmas movie is Gremlins. Happy holidays to you too. The Hobbit was awesome and the barrel scene was hilarious! I was really creeped out by Orlando Bloom's eyes the whole time though. Like...you could tell his were fake compared to everyone else. I did the same thing as your wife except my reaction was more along the lines of "NO. WHAT?" Other people in the theater did it too though so I'm not too crazy! I had no idea until the end of the preview that it was Godzilla. It was pretty stunning, to say the least. Laura, glad you're on board! Elizabeth, that's funny! Nothing like a colorful metaphor. And yes, it will be a signed copy. Liz, glad you joined us. Deniz, that's my point exactly - if you didn't know what it was, then the teaser was very effective. And I talked to the kids through email, so no in person for me. Vanessa, I think it's a Christmas movie as well. Samantha, that was the funniest part of the movie. And I knew the Godzilla trailer would be more effective if you didn't know it was coming. Awesome guitars. Happy Thursday, Alex! Hi Alex! I love those guitars! Especially the first one. Although I thought the beginning of the Hobbit was pretty slow, it certainly did pick up. I'll be seeing the next two installments as well. Hope you have a nice christmas! Those guitars are fantastic! But I bet very, very pricy. I cannot wait to see The Hobbit this weekend! I forgot your post said that this was your last posting before Christmas. I stopped by your blog to wish you and your wife a Very Merry Christmas and have a safe Holiday! Lisa, it's given you ideas, hasn't it? Pat, the second one has a much faster pace. Julie, more than I want to spend. Alex, you always have so much going on. Wishing you and your family a Merry Christmas and a Happy New Year. those guitars are amazing- !! Have a great Christmas and Happy New Year- and thanks so much for your always ever so nice comments! Cheers! So my wife and I watched The Desolation of Smaug. There was a lot of action and the cliffhanger is a really big one. However, we both were not really happy with the movie. We missed what we both call "magic moments" which we got in Lord of the Rings. Of course we will see the the final one in 2014. I'm glad to hear Hobbit 2 is better...as I wasn't that impressed with the first. I may just watch it now. My son rented 'The Hobbit' this week and we really liked it. We're looking forward to seeing the next chapter. Although I have to wonder, why didn't Gandalf's birds just fly them all to Lonely Mountain? Plus, my son had what I consider a great line after Bilbo said, "I think the worst is behind us." He said, "Well, unless you consider that there's a DRAGON in that mountain, yeah." It's probably for the best that I don't play guitar, else I'd be spending a ridiculous amount of money on that Alien one. Ye gods, that's awesome. And wholly agreed about "The Hobbit". The whole thing was a ton of fun, even moreso than the first one, and that ending was perfect. Best way to leave everyone wanting more. Bwa ha ha. Edi, can't miss the third one. Al, good point. And why didn't those birds just fly Frodo to Mordor? So exciting at your blog Alex. First we have sci-fi guitars, Kimberly's wonderful letter a Hobbit review and secrets to successful book marketing? I wish I could keep up. Can't. Have a great holiday and Happy New Year too. The guitars are too awesome, Alex. Glad you liked the Hobbit. those guitars are soooo cool! alien one is awesome! and of course there was a massive cliffhanger. thats what they do! Pretty sure I'd seen the Millennium Falcon guitar before, but not the others - awesome stuff! I think the last one might be my fave. Had to sign up for the marketing 'fest! Looks like it will be super useful! Merry Christmas to you Alex - I hope you and your family have a wonderful end of year! My sisters and I saw The Hobbit on Friday, and it was AWESOOOOOME! :D I love the additions, and that whole segment with Smaug was so mindblowing! I'd have to have a special place for one of those guitars, but I loved seeing them. The Hobbit is on my list of must see movies. Desert, thanks and same to you! Tara, it was very cool. Trisha, same to you, and thanks for joining the symposium.